The MIB was established with a $100,000 bequest from the Barwick family, and the fundraising efforts of the late William Turner, a businessman, and Denis Brott, a cellist, both of Montréal. Since then, individuals and foundations have donated or loaned violins, cellos, and bows—created by such master craftsmen as Stradivari, Guarneri, and Gagliano—to the Bank, and made generous bequests for the Canada Council to purchase additional instruments. The Canada Council’s Musical Instrument Bank has supported many notable Canadian classical musicians—including Lara St. John, Alexandre Da Costa, Martin Beaver, Judy Kang, Denise Djokic, Marc Djokic and Roman Borys. Read the cumulative list of winners. The peer assessment committee has selected this year’s winners — promising Canadian classical musicians about to embark on an international solo or chamber music career. And these musicians have each selected an instrument from the Canada Council’s Instrument Bank — some of the world’s most legendary cellos and violins. Over the next three years, these recipients will take the next major step in their performance careers with their instruments. For a full list of this year’s lucky winners please visit their webpage. 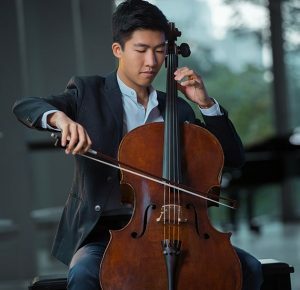 Winner of the 2017 Canada Council for the Arts Michael Measures Prize, Canadian cellist Bryan Cheng has attracted widespread attention for his “absolutely astonishing” (La Presse) command of the cello, and his “abundant facility, innate musicality, and sense of joy” (New York Concert Review).Bryan is second prize winner of the TONALi18 Grand Prix in Hamburg, first prize winner of the National Arts Centre Bursary Competition, a second prize winner at OSM Manulife Competition, and was named one of CBC’s 30 hot Canadian classical musicians under 30. He made his solo debut at age 10 with the Orchestre de chamber I Musici de Montreal, his Carnegie Hall recital debut at 14, and most recently his Elbphilharmonie solo debut with the Deutsche Kammerphilharmonie Bremen. As a soloist and recitalist, he has performed in every Canadian province, a dozen countries, and on three continents, with a repertoire spanning five centuries, including eleven world premieres.He has released two albums on German label audite to worldwide acclaim: Violonchelo del fuego (2018) and Violoncelle français (2016). 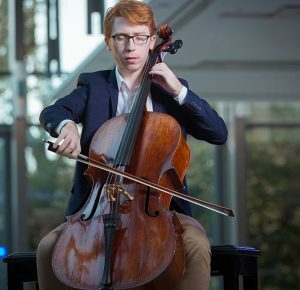 Described as a musician of “profound musical imagination” (Toronto Concert Reviews), Cameron Crozman has established himself as one of Canada’s leading young cellists. Awarded the use of the Bonjour Stradivarius cello and the Shaw Adam cello bow by the Canada Council for the Arts Musical Instrument Bank in 2015, Cameron’s engagements have taken him to important venues throughout North America, Europe, and Asia.Cameron regularly appears as a soloist with orchestras in Canada and France, and he’s performed with the likes of James Ehnes, André Laplante, James Campbell, and members of the Ebene, St. Lawrence, and New Orford String quartets. Selected for Gautier Capuçon’s 2016-17 Classe d’Excellence at the Louis Vuitton Foundation, Cameron has recently completed an artist diploma in contemporary performance at the Paris Conservatory, where he received a Master’s degree in the class of Michel Strauss. His performances have been broadcast on CBC, Radio France, Radio Classique, and medici.tv.